Jacob Evans is a tough, two-way wing with good versatility and promising role player potential fresh off a season where he led a Cincinnati team that ranked as high as 5th in the polls. A consensus top-150 prospect in the high school class of 2015, Evans provided valuable bench minutes as a true freshman for Mick Cronin’s Bearcats, but blossomed as a sophomore, solidifying himself as a key cog for one of the nation’s best defenses. Makes set shots at a strong rate and stays active on both ends. Averaged 13 points, 4.7 rebounds, and 3.1 assists per game as a junior and earned All-AAC First Team honors as the Bearcats finished the season one defensive stop away from a trip to the Sweet Sixteen. Has nice potential as a floor spacer as his touch improves. 33% of his possessions last season were Spot Ups, which he converted for 1.012 points per Spot Up possession [69th percentile]. Shoots the ball with fluid mechanics, but rushes things when pressured on some attempts. 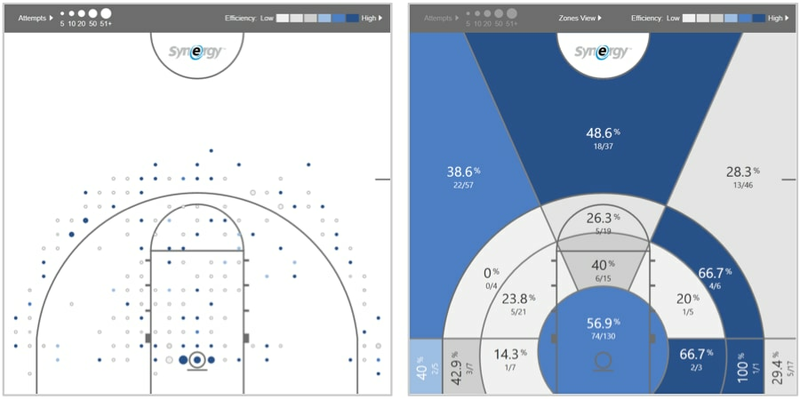 Leaves some shots short with a flat trajectory, but showed significant improvement as a shooter at the college level and could continue to grow in that regard. Also capable of making some things happen off the dribble. More the type to take what the defense gives him than break down defenders and create for himself. Draws and kicks unselfishly and shows some ability to make simple reads out of the Pick & Roll. Much more opportunistic than aggressive attacking the rim. Scored 1.219 points per shot around the rim in the half court [68th percentile], attempts which made up only 20% of his total looks. Can play above the rim with a head of steam, but scores most of his points inside thanks to his timing, touch, and ability to hang and shoot with both hands. Does a little bit of everything offensively. Runs the floor extremely hard, can grab and go cleaning the defensive glass, makes timely cuts, and crashes the offensive glass well for a wing. Evolution as a jump shooter is the key to his ability to carve out a role in the NBA long term. Plays with great poise defensively. Has good feet and the length and intensity to hold his own defending on the ball. Doesn’t lose focus when defending away from the ball. Allowed just 0.683 points per Isolation possession [67th percentile] and did an excellent job in limited opportunities against bigger forwards in the post. Has some versatility on the defensive end. Plays with a more disciplined than aggressive approach. Blocked shots and drew charges by sticking with plays and helping energetically. Easily ranks as one of the more polished defensive wings in this year’s draft.